One of my best memories in college was eating lunch with my close friends at a small cafeteria less than a block away from our school. It was located in a street corner directly opposite the building of the Department of Foreign Affairs in Cebu before it relocated. This small eatery had the best pork giniling I’ve ever tried, the one that makes you order a second bowl of rice and savor every bite. 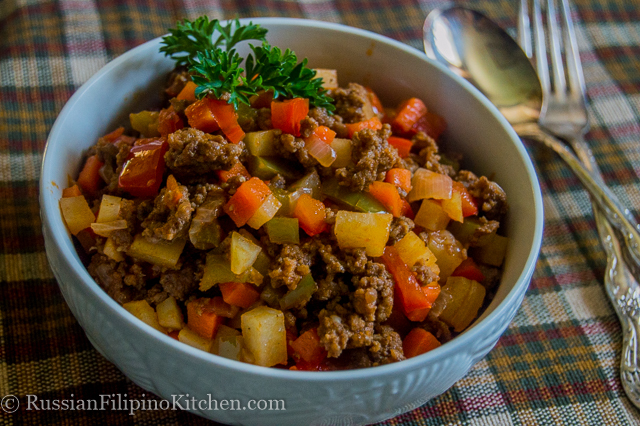 Giniling is a Tagalog word for ground meat, and in Philippine cuisine refers to a dish made of ground meat (can be pork, beef, or chicken) with diced potatoes, carrots, bell peppers, peas and raisins simmered in tomato sauce, a little bit of water, soy sauce, and some seasonings. It’s cooked till most of the liquid dries up. This goes great with warm, boiled rice. For this post, I decide to share how to make beef giniling. There’s not much difference taste-wise between pork and beef when used in the recipe so go ahead if you prefer using pork. This beef giniling recipe is very basic and simple. I omit the peas and raisins because some members of my family are picky with the hint of sweet taste, but rest assured the dish tastes as delicious. Enjoy! 1. Soak cubed potatoes and carrots in 1 cup of water and set aside. 2. Brown beef in skillet on high heat until no longer pink and most of the oil comes out, about 7 minutes. Remove excess oil, leaving about 2 tbsp just enough for sautéing. 3. Throw in garlic and onions and cook for about 5 minutes till garlic has slightly browned and onions are translucent. 4. Add soaked potatoes and carrots, discarding water. Sauté for 1 minute. 5. Add bell peppers, and mix. 6. Add soy sauce. 7. Add tomato sauce, salt, and pepper, then mix. 8. Cover skillet and simmer on medium heat for 15 minutes, stirring 3 times in 5-minute interval until potatoes and carrots are cooked through and most of the liquid has evaporated. 9. Serve with rice or if you are on a diet, eat as it is, to cut on the carbs. So yum! Ikaw na nga ate. Are you a chef? Thanks! Nope, I’m just a regular housewife with a passion for cooking 🙂 Thanks for checking out the recipe. Hello Mavis! It’s a fusion of Russian and Filipino recipes that I make for my family. I am currently based in Sacramento, CA. Click on the “About” page above to read more about me and this blog. Thanks for visiting! Sarap! I added a little sugar though. I’ve never put bell peppers or tomato sauce in mine. Only the carrots and potatoes onion and garlic. Then I use beef stock and some of the reserved beef drippings. Also I mix mine with ground beef and pork. I never had a recipe or a name to go along with this recipe. I just recreated it after we had it at a Filipino restaurant, but they put ALOT of oil in there’s and let it soak there. I wasn’t comfortable using that much oil which is why I substituted beef stock for the oil. Thanks now I finally have a name for it! Thank you Mia! I’ve been looking for this recipe. Will definitely make this as I’m craving for it. More easy filipino recipes please. Thanks again! You’re welcome! I hope it turned out great! This was fantastic! I used half the amount of meat and added quite a lot of the tomato sauce and some stock. Thanks so much for sharing!